From industrial and commercial grades to military grade variants, Impact Cases offers you a comprehensive line-up of high quality shipping cases and shock mounted rackmount cases. 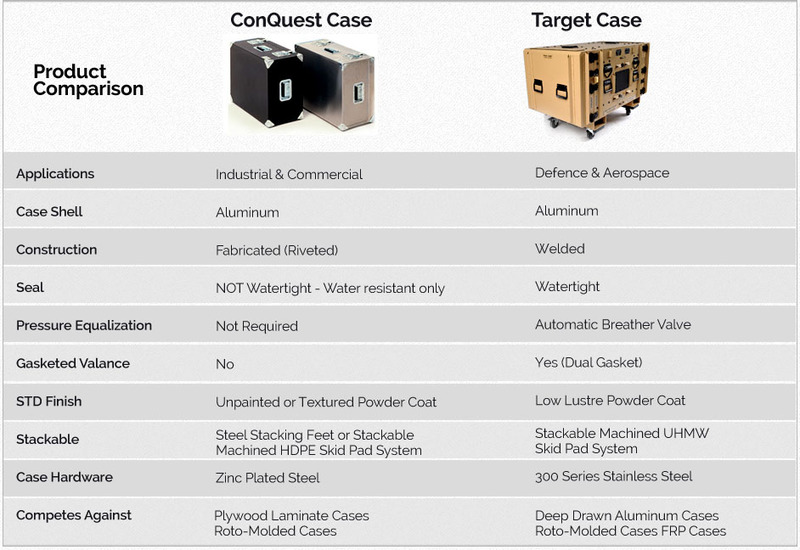 Many customers find that Conquest and Target cases are the perfect off-the-shelf solution. Just determine the line that’s right for your payload and check the size chart and contact us. Remember, we offer a variety of customization options to suit your specific application. ConQuest Case™ and Target Case™. Typically used in industrial and commercial environments where equipment protection is paramount, but the equipment and cases are not exposed to outdoor elements for significant periods. Normally reserved for aerospace and defence applications where the equipment protection includes prolonged exposure to the elements, Target Case™ products have a watertight construction and incorporate stainless steel hardware to resist corrosion. Learn more about the product lines that have set the industry standard.